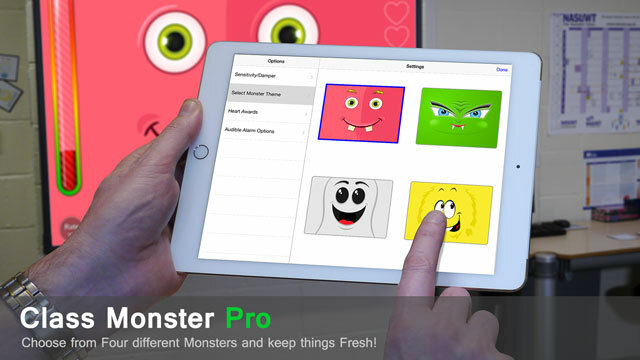 Class Monster Pro is for anyone who has attempted to keep the noise levels under control of a group of youngsters! This is a fun app that children enjoy and respond to. The app displays graphically the background noise level in a room in a fun and engaging way. As the noise levels get too high, as determined by the adult in charge, the Monster (there are 4 to choose from in the Pro version) gets upset and, if the levels of noise stay unacceptable high, the monster starts crying. On occasions, it may well be that a higher level of background noise is acceptable, depending on the activity the children are engaged in. In this case the responsible adult can adjust the sensitivity of the app so that a higher level of noise is required before the monster gets “upset” and starts crying. There is also a “Damper” setting that helps the user control the movement of the volume indicator. There are five different “Monster Crying” sound effects to choose from. You can even record your own! There is a screen cracking effect can be turned on and off for when the Monster starts crying. A “Heart Award” can be allocated when an acceptable level of noise has been maintained for a set period of time (configurable from 1 to 15 minutes). The Heart awards are displayed as they are awarded. When ten heart awards have been awarded a “Super Heart” award is displayed. Heart awards can be manually added, removed or reset by the adult in the settings screen. The “Heart Awards” can be switched on or off as required. Information on how well (or badly) a particular group of children have controlled there noise levels can be emailed out from the app. You can set the length of time the monster cries for from 2 to 13 seconds. There is a Help page available from inside the app and the developers can be emailed directly from inside the app with any issues or suggestions for new features or improvements. Before you write a bad review, please contact us via the email button in the app for solutions to problems, or to submit feature requests. We can’t fix what we don’t know about, and writing a bad review is not the way to report a bug! We cannot reply to negative reviews to help, so please give us a chance to respond.